They may be rivals as two of the city’s largest office landlords, but SL Green Realty and Vornado Realty Trust worked together to make the $150 million renovation of 280 Park Avenue pay off. The real estate investment trusts, which jointly own the 43-story office tower, have signed Medley Capital to a new eight-year lease while substantially expanding existing leases for PJT Partners and Harvest Partners at the 1.2 million-square-foot property. Medley Capital is leaving the nearby Seagram Building, at 375 Park Avenue, for 22,000 square feet on 280 Park Avenue’s seventh floor. Asking rent for the space was $105 per square foot, according to Crain’s, with a JLL team representing the tenant and a CBRE team working with Vornado executive Andrew Ackerman on behalf of the landlords. SL Green and Vornado also secured investment banker Paul Taubman’s PJT Partners to an extension at 280 Park – adding 50,000 square feet on 17th floor to the firm’s existing 100,000 square feet on the 15th and 16th floors. The REITs also doubled private equity firm Harvest Partners’ space in the building to 38,000 square feet in the western spire of the building’s two towers. Asking rent for both expansions was $120 per square foot. Savills Studley represented PJT Partners while Newmark Grubb Knight Frank represented Harvest Partners. The deals indicate how SL Green and Vornado’s $150 million renovation of the office tower has paid off, with the building now almost fully leased. The landlords, who entered a joint venture at the property in 2011, gut-renovated the building’s lobby while making a host of other improvements, installing new elevators and upgrading systems. 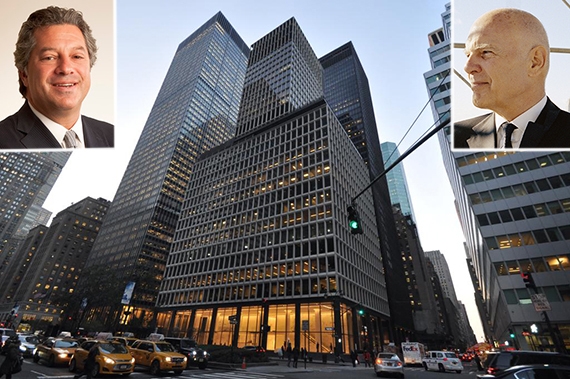 Mutual fund giant Franklin Templeton signed a 15-year lease for 126,000 square feet at 280 Park Avenue earlier this year, while Singaporean government-owned fund manager GIC agreed to take 50,000 square feet at the building in June.